Find hotel near Metropolitan Ervin Szabo .. The Metropolitan Ervin Szabo Library is quite a frequented destination amongst bibliophiles. 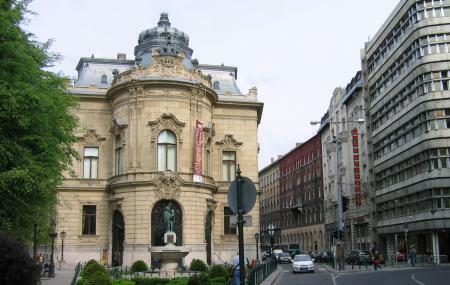 It is the oldest and the biggest library of Budapest. This place gives you a proper feel of the olden times as it was built in the 19th century and boasts of Neo Baroque architecture. It is housed in Wenckheim Palace and has extended over time as the collection grew and the place was not enough. It has more than 1 million books today under its name and is a lovely place to visit, see the great collection and re live the old times. Documents from the stocks can be required until 7:30pm every day except Saturday. On Saturdays they can be required until 3:30pm. Children and music library: check the official website. How popular is Metropolitan Ervin Szabo Library? People normally club together Dohany Street Synagogue and Holocaust Memorial Center while planning their visit to Metropolitan Ervin Szabo Library. So pretty. I was lucky to go in for free. Spent 2 hours of my day trip there on reading. I my personal opinion this is one of the hidden beauties, if you travel in Budapest! it is worth to get the day ticket and and spend about 1 hour in this old and historic palace which has now been converted into a modern library. You will discover antique interior design like in a palace, which is used by young crowds and students as well as by local people such as me and my own family! you can also have a quick look at the unique children library section! Such an exquisite library experience. this really is the most beautiful library in the world I think. it's like a mini Versailles and one you can get up close and personal with and actually sit in and enjoy the splendour. a little bit confusing to enter at first but do hang in there, don't give up! One of the most beautiful architectual masterpiece of Budapest in the neo-baroque style. Must see. We were really keen to visit this library as we were told it was stunning inside. Unfortunately it we were disappointed to learn that we had to pay a entrance fee and then pay additional charge for the WiFi per hour.